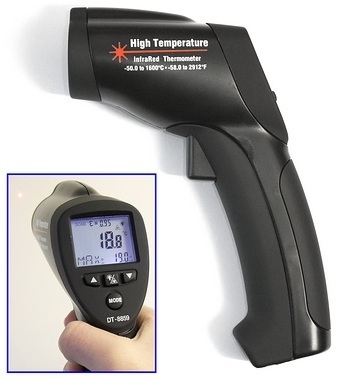 The DT-8859 is a non-contact infrared digital thermometer, it is designed for high temperature measurement without the need to touch the surface being measured. It is quick and simple to use with a large, easy to read, LCD. It also calculates, and stores for later viewing, the Maximum, Minimum, Difference between Max & Min, and the Average of last measurement (the duration the trigger is held for, or longer in Trigger Lock mode). It can measure temperatures in the range -50° to 1600°C, with 0.1°C resolution across the entire range. Recording and display back of Maximum, Minimum, Difference between Max & Min and Average of last measurement.